29 September 2009 – St. Michael’s Day – Mussolini too! I’m taking the train down to Rome today, so I’m thinking of Mussolini too. Both the Stazione Santa Maria Novella and Stazione Termini (Roma) come from that era and they are both remarkable installations. The outbuildings along with the termini all have clean lines, are beautifully constructed from quality materials, use great type faces for all the original signage, and excite you about travel. These will not be the only Mussolini buildings that I will experience today. I leave at 8:30 and get into Rome at 10:00 sharp – he did make the trains run on time. I get on the subway and take it over to Circo Massimo thinking that it will put me right by the entrance to the Palatine Hill stuff. Wrong. I walk around the entire Foro Romano before I can get in – and it’s a nice walk that takes me through Michelangelo’s Capitol, Ara and gives wonderful panoramae of the forum. The beggars are gone! The forum was always filled with less-than-nice beggars – and somehow they’re no longer around. I still had to wait in line for a ticket, however. Overheard conversation: Italian wife, “let me go ahead and see if we can move more quickly through this line.” She leaves, and then comes back to report, “We have to pay for the Collosseum as well. I think that’s free, oh, wait you’re not an EU citizen.” Canadian husband replies, “Why are we here? What is this place?” A dumb-founded silence followed. I’ve been here before and I really want to see three things: 1) Domus Augusta, 2) Domus Liviae, and Domus grifoni. It’s Tuesday, so the house of Augustus is immediately stricken from the list, but the other two are open, and almost deliver the same sense of awe I felt the last time that I was here, when I went to the Domus aurea (Nero’s Golden House). The intact painted walls and plaster work always impress me. I fully expected Sian Philipps to come walking right out and give me a look. I’ve not planned ahead, and didn’t bring water with me. No amenities in the foro. I trudge on. There are special exhibitions around the rule of Vespasian, so that is all very interesting, and I enjoy it immensely. The Farnese Gardens are a big (huge) disappointment, although the overlook to the forum is just amazing. Being very thirsty and having had my fill of all things Roman, I leave by way of the Colloseum, grabbing a photo of the Arch of Constantine and heading for I restaurant I know on the Via Cavour, where a spaghetti carbonara is calling my name. While there, a German family next to me puts their eldest daughter’s newly minted Italian to the test with the waiter – armer Mensch. I go up Cavour to the metro again, and take to Termini, and then get on the other line up to Spagna. (While on the trip I see an unreal situation with a young blond woman who reams out an other woman (70) for taking a seat on the subway. The older woman gives it right back to her.) The steps are mobbed. I walk over to see if La Rampa is still there, with a wonderful menu, but I’ve just eaten, and the panna cotta that they’re offering comes with arancia rather than fragioli. So I go over to Via Santa Croce to a place where Barton and I had a wonderful meal twenty (can it be!?) years ago. It is the Otello alle Concordia, and it is there that I have my panna cotta. Via Santa Croce continues right across over to the Tiber to the Ara pacis, which I have been trying to see for years. It sits as the fourth side of a quadrangle surrounding the Mausoleum of Augustus. One of the sides is dominated by a baroque church, while the third and fourth are wonderful Mussolini buildings. It was he who built a pavilion for the altar here, which building has now been replaced by a handsome Richard Meier building. The altar is everything I hoped it would be, so I buy a book that will tell more about it than I probably need to know. Now what to do. My back is bothering me. I had thought I’d go to St. Peters, but decide not to, dropping by the Pantheon (choir singing, Scarlatti being played) and Piazza Navona instead. I painfully make my way back to the Spanish steps and take the metro to the train station where I drink a huge Coke and read the book. I’m ready for home. You thought I was going to put the tower there, didn't you. Admit it. If you take the train to Pisa, you have to march across the entire city to get to the Duomo. Along the way, there's not much. There is Santa Maria della Spina, which was built on the Arno in Pisa as a repository for a thorn from the crown of thorns (I wonder if those people at Sainte Chapelle realize that they are missing one thorn?) It's a delightful building, although it was closed. The quality of light in Pisa is different, perhaps because it's closer to the sea. The carara marble close to gleams in such light. There is another interesting place along the way, and that is the Orto botanico a beautiful garden associated with the University - that unfortunately was not open. I could see bits and pieces through the fence and it looked quite inviting. The train trip to Pisa was uneventful. I had a First Class ticket and there were only Second Class cars. Buying tickets on Italian trains is always an iffy proposition. No mind, it was great to just sit back and let the countryside move by. The guidebook called the western tuscan countryside "unremarkable", but I found it quite inviting with huge stands of cane, fields of hay, rolling in a Kansas kind of way. The trip takes about an hour. So you walk through town - pretty gritty. Well, Florence, is gritty too, to be honest. The buildings in Florence keep you from looking at the grit. Pisa does not have that grace. The walk from Centrale to the cathedral takes you right through the university section, and then suddenly you're there. Oh, I forgot the Arno, which until it silted up, made Pisa a major port on the Ligurian Sea. They traded with Spain and with North Africa, which fact becomes important later on. The Arno is very wide in Pisa, and so huge bridges cross it at points. Looking down from della Spina you can see a very large and tall fortress guarding the waterway. 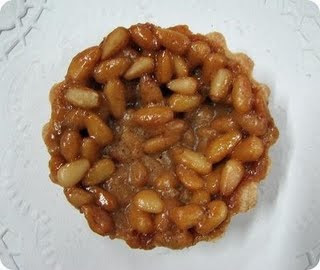 As I approach the cathedral I feel the need for food, and have a wonderful tartina alle crema, a little pastry shell filled with pastry cream and pignola. (Arthur and I had something very much like this in Sevilla, Spain, once). The compound reveals itself slowly. You first become aware of the apsidal end of the cathedral at the end of the street, and when you arrive at spreads out in front of you, gleaming and white. To the far left is the Baptistry, and in the background the campsanto, the cathedral itself (immediately in front of you) and slightly to the right - the tower. Each of these elements requires its own ticket! So I go get one. The campsanto is really an enclosed burial ground, filled it is said with soil from the Holy Land. It looks very much like a cloister, a rather elongated one. One enters on the long side of the rectangle, with the chapel end on your right. At the end of the Second World War, a bomb hit the roof of this structure, and it burned, taking with it the precious frescos that line(d) the side of the cloister. 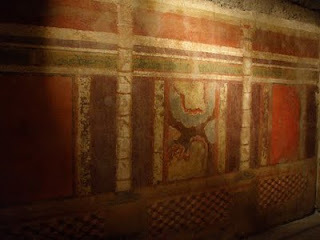 The roof has been restored, as have some of the frescos. What they did save in some instances were the underdrawings of the series, which are now housed in a research facility called the museo sinopia. 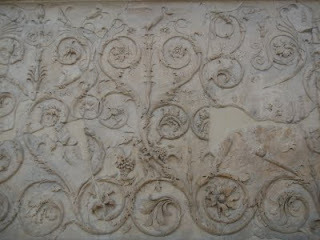 Along with all of this are hundreds of marble sarcophagi from ancient times to the last century. 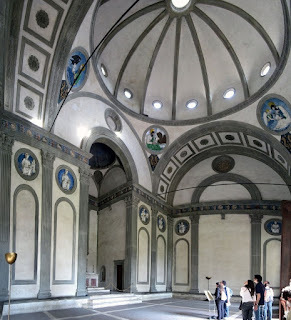 The interior of the Baptistry was remarkable in its simplicity, and its unusual dome. The actual font is huge; large enough to allow immersion. I wonder when they stopped. So it reflects an ancient usage. There is an altar, a particularly beautiful ambo, and a stunning pulpit. I climb up to the gallery, hoping to shoot the font from above, but we are kept from the edge - the shot is not possible. The baptistery is not popular, people pop in and then out, rather than taking in the quiet and restraint of the building. It is refreshing. I have not bought a ticket for the tower. It is another 15 euro, and a lot of steps and waiting around. So I look at the tower, and then move on to the Opera, the museum of the cathedral opera (works). Like all Italian buildings, these shed as well, and so the detritus is kept in the museum. 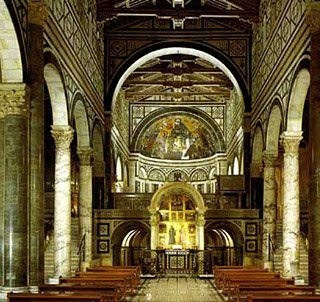 Of special interest are a collection of ancient findings on the compound (a paleochristian church sits under the cathedral) and an excellent collection of vestments. Also interesting are architectural details that document the Arabian influence of both Spain and North Africa upon Pisa artisans. It's time for lunch, so I walk up the street a bit and get a seat at an outdoor restaurant. I order the papardelle con salsa lepere. It's a tuscan specialty - broad noodles with a rabbit sauce. It was delicious. Next to me, however, was something just as delicious. An older woman was seated with a much younger man. In a way, I felt as though I were sitting in a scene from "The Roman Spring of Mrs. Stone". The woman, who was probably in her fifties, was desperately trying to look younger. Her hair was at least five shades ranging from blond, through orange, to an almost red. She had on heavy eye makeup, black with blue highlights, two shades of lipstick, that outlined her lips in a darker color. She had on a revealing silk(?) blouse that was a very colorful print, and she was tanned enough to worry an oncologist. The young man, probably 15 or so, was incredibly beautiful with curly dark brown hair, clear skin, the traces of a beard, and bright bright eyes. They had an animated coversation in Italian, and fought over the bill, after sharing rabbit stew with grilled polenta and espressi. I wonder what the story was. After lunch I go over to the museo di sinopia to look at the cartoons of the frescos from campsanto. There is a 3D presentation, in which you can see how the frescos looked prior to their destruction. I find one cartoon with a name, and fecit, "so and so made this". People did this work and they recorded their faces, their troubles, their vocations, their clothing, their faith, and their troubles. It was quite moving. There is another museum in town, but I am undone, and ready to just get on a train and get home. So that is what I do. The afternoon train is rattier than the morning one, but it is relieved by two young men who are traveling together from Pisa to Milano. They are a couple, young, and cute. There is, however, a cultural war going on (much like the one I saw on the plane from Frankfurt to Florence.) The shorter Italian boy has made all of the arrangements, and when the conductor comes there is the usual Italian bureaucrat problem. "You were supposed to validate these tickets in the machine" they are told, as am I. Funny, I didn't have to do it in the morning. This sets the other one (the German) off - "Next time we fly!" It was interesting to watch their faces as they sparred, pouted, made up, and moved on. Back in Florence I drop by Santa Maria Maggiore for a brief visit - a nice calming little chapel. I drop by Feltrinelli to buy at walking map of Rome - I need to plan for tomorrow - and stop by for a sorbetto al limone at a place right behind the cathedral. When I get back to my room I suddenly feel the need for a nap - and take a long and deep one - full of dreams. Now i write this and have a panino con tonno e pommodoro. The end of a nice day. I wake up at three, change into jeans and hit the streets. My goal is to hike up to San Miniato, have lunch, and then hike down again. Simple enough. However, on the way, I pass by Santa Croce and am lured in. I can't go to Santa Croce without recalling "Room with a View". This time however the fact that the entire south side of the nave is wrapped in plastic (including Machiavelli, and Dante, but not Michelangelo) I am quickly disabused of the film, and can enjoy it on its own merits. 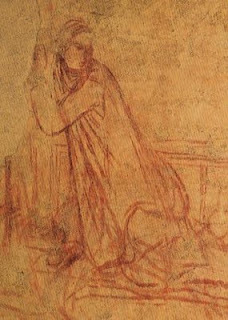 As I visit the chapels and see Giotto after Giotto, I realize that this is a work which is constantly being rewritten. Looking at the magnificent tomb of Gallileo (why didn't they honor him while he was alive?) I can see that it was layered on top of some magnificent frescoes that were simply interrupted. Each age adds its own. To the left of the high altar, two chapels away, is what looks to be a WWII monument, with interesting moderne bas reliefs and pieta, along with what appear to be venetian glass sconces on both sides. 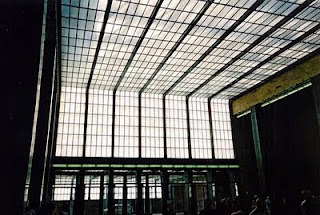 There is modern stained glass, as well. Very nice - almost refreshing. Given the wonderful gothic church and its magnificent ceilings and sacristy, it is a bit of a shock to walk into the Pazzi chapel. One gets the same effect at the new sacristy at San Lorenzo with the simple classicism and lines, and a minimum of decoration. The della Robia rondels are also of a different type - slimmed down and more direct. The room literally takes your breath away. The portico is refreshing as well - such a change from the busy character of the main church. It is here that I find monks buried with a cedar planted over them. I am heartened to know that I wasn't dreaming that one up. The Brunelleschi cloister is also a delight of simplicity. 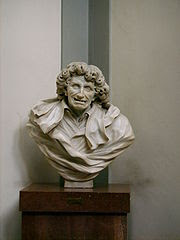 In the museum of the Opera, they are once again displaying works that were damaged in the flood. The Cimabue hangs with all of its scars - almost like badges of honor. Other works are slowly returning as well. I cross the Arno and walk along the south bank up to Porta San Niccolo where I begin a slow ascent up to Piazzale Michelangelo. Each step of the way gives way to a more and more stunning panorama of the city below, marred only by the crane at the Uffizi, but it even melts away in the golden late-afternoon sun. There is a lovely restaurant at the top - closed, so I go to a "bar" on the side of the road where getting waited upon seems like a work of Sisyphus. Finally I get a panino con tonno e pomodoro, and a coke. I figure that with all the walking I've done, and am just about to do, my system can dispose of the sugar. They were delicious. I ascend up the hill to San Salvatore al Monte, but don't go in, continuing on instead up the porta sacra and walk up to San Miniato. If Santa Croce is all about Franciscan excess (that doesn't work, does it - but that's the fact), then San Miniato is all about Benedictine restraint and order. The original buildings date from the 12th Century, but all has been extensively restored. It is late in the afternoon and the light is quiet dim inside, but the splendor of the mosaic, and the frescoes is still perceptible. The evening office is being sung by the monks in the lower chapel, so all is loveliness and beauty. It does make one believe. Now it's cross country. The terrain is a series of valleys with gardens and olive groves at the floor and grand, but simple homes at the tops. Viale Niccolo Machiavelli twists and turns as it descends from San Miniato down to Porta Romano at the bottom. On the way I stop at a simple cenotaph memorializing foot soldiers from WWI. It is surrounded by hundreds of cedars. I had to pause for a moment. About half way down I realize that I can follow a chain of parks that go directly down the hill slicing through Machiavelli's "S" like a "$". The parks are lovely (and the sounds are eerily like Antonioni's sound track for "Blow Up"). There are quiet walks, lovely bonds, and smell of "grass" as I pass by a group of young men. (...Hey!...) Now I'm skirting the Boboli Gardens, as I make my way past the Palazzo Pitti and across the Ponte Vecchio. I go to the hotel - check email and then go out to dinner at Il Caminetto right to the south of the cathedral, where there is a caprese and a lombardini di vitello ai carciofi waiting for me. It was remarkable. 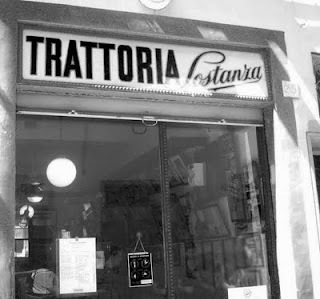 This, by the way, is probably one of the best restaurants in Florence! Every, time I'm here, I eat here. The food is simple, unapologetically toscano and quite simply delicious. As I passed it this morning, on my way to church, I recalled my first time there with my friend Barton Sheffield. At the end of the dining room, one could see back into the kitchen where there was a large wooden chopping block. Sitting on the block were large sections of beef, pork, and veal, awaiting the orders of the customers. On Saturday, I passed another butcher shop, and there in the cases were large pieces of meat, awaiting the same orders. The thought came to mind, that a society so bound by a sense of community, family, and culture should yet value the individual slice, the piece cut to order, the piece that meets individual expectation. It is equally odd, that such individual choices so beloved by Americans, are simply not available to most Americans. Ah, the sociology of meat! 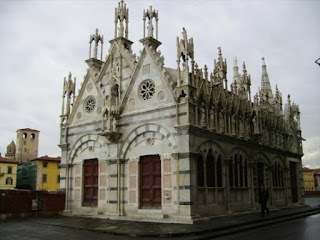 I go to Saint James American Episcopal Church in Florence. Since I learned all of my sense about time and church from my father, I get there an hour early - time to check out the place. There is a lovely garden and outbuildings (office, rectory, all designed to look more at home in Venice than Florence). The church itself was built in the first decade of the last century, with its cornerstone being laid by the U.S. Ambassador to Italy. Who says we don't have a state church? The building is OK, but in a city of stunning churches, I guess its OK for this church to just be OK. My tour of the grounds doesn't take that long, so I sit in a nice park bench that is directly in front of the church portico. My thought is that I'll pretend I'm at Taizé at Trinity and that the silent meditation is 45 minutes long rather than 10 minutes long. People come and go, all of them passing me by. The ushers look out, anticipating crowds (There was a breast cancer Correre per Vita - and here the color is orange, not pink) however many are running the course and not attending St. James. Finally I enter, and there is a good crowd, a visiting priest from France (the new rector is coming in two weeks), and lots of people from Malawi. The service is BCP, and in the pews (I'll have to get one) are BCPs in Italian (naturally) and German! The sermon is quite good, with the priest speaking on inclusion and discussing quite pointedly the decisions of the American Church to open up all orders to LGBT people. The crowd didn't stir, not even the ones from Malawi. I was impressed. Good hymns, lousy organist - there was no true prelude, just sort-of toodling around on the nice new instrument. This, however, has to be one of the most unfriendly churches that I have ever experienced. With the exception of the priest (who visits San Francisco frequently, and with whom I'll keep in touch) not one single soul said, "hi," "boo! ", or "go away". Perhaps they are inured to visitors - we don't pledge. This, by the way, is really not all that unusual. There were various signs and announcements of welcome, and commentary on how this is one friendly church. Like most churches - it couldn't be bothered to make it work. I saw it at Saint Francis, and I see it at Trinity. And we wonder why people don't come back. 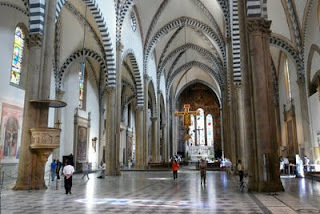 On my way back into the center, I decide to revisit Santa Maria Novella. I don't spend a great deal of time. What is interesting about this building is that it is quite stunning in its simplicity. Of course if you get up close, you can see amazing details, but standing back in the nave all is focused on the large crucifix suspended before the crossing. It is enough to enter, walk around a bit, remember, and then go on. Part of the problem is that being in Florence is like eating chocolate for breakfast, lunch, and dinner for days on end. Finally there is a digestion problem. I go back to the hotel and sleep for two hours. After lunch I walked to the Bargello, former prison, now art gallery. This is the place for Donatello, Della Robia, Michelangelo, Verrocchio, and fellow travelers. This building was extensively redone in the nineteenth century, as was half of Europe. The window in the Magdalene Chapel is so much a product of that time, that it betrays the whole effort. Here the building, in its present form, is not so important as what's in it. The Uffizi is highbrow art, and the Bargello is that along with a bit of the family attic. There is metal work, limoges, majolica, Islamic art, a wonderful collections of ivories including some Byzantine and Carolingian pieces which show the latter's dependence on the former. It's a marvelous collection, and today it was free! After all of that it was time for a copa di straciatella my favorite gelato, and a walk around that district. All of the ecclesiastical haberdashers were closed, so that was no fun. It was clear at that point that a nap was in order. In the evening I wandered around looking for a restaurant. Saturday nights in Florence are mad. Everyone is out, and all of the Ethiopian sales people are running around like crazy when a police car is sighted. So I found this place on a vicollo and had crostini with liver, a nice veal steak grilled, accompanied by white beans with rosemary and olive oil. Panna cotta for dessert. I am next to a couple of students from KU Lawrence. One is an art major and I try to convince her to ascend the cupola at the Duomo. I hope that she goes. The mosquito is still here when I get back to my room. a good history of the period and of his own ministry, theology, and downfall. There are relics, crucifix, hairshirts, part of a garment and a cloak. What might have been thrown away now becomes something precious. 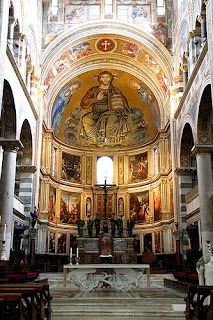 (Later in the main church, Saint Anthony, former bishop of Florence, and monk at San Marco, is seen laid out in full episcopal splendor, mouldering below the altar. The tie between politics, or should I say republican politics, and ascetic life was something that I had not anticipated. Of course one sees all kind of religious reflections of d'Medici glory, but I am talking about something totally different - which is what the good monk was doing as well. He, however, became fuel for the fires of fear and tyranny. Of interest in this regard is an unfinished painting by Fra Bartolomeo called the Signoria Altarpiece, commissioned by republican Florence. In the painting, the patron saints of Florence are having a consultation with the Virgin, a sort of divine democracy in action. Most interesting is the figure that appears above the Virgin, and the putti. It is a head with three faces - each distinct. Is this the Trinity in its own conversation? 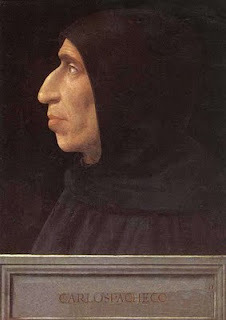 There is another work by Fra Bartolomeo that is striking as well. It is a portrait of St. John the Baptist, a dreamy John the Baptist, youthful, attractive, relaxed - no ax to the root here. Something else struck me at San Marco, as it did at the Uffizi, and later at the Bargello. It is the ceilings. They are not covered over, but one is allowed to see the trusses and underside of the shingling. They are beautiful, economical, and probably cold. Buildings shed. I first encountered this the last time I was in Florence and climbed the steps up to the cupola of the Duomo. In the rooms that surround the dome are the leavings of the cathedral: balustrades, consoles, cornices, columns, statues, medallions, and so on, all resting from their labors. So it is in the ledge room of the monastery, with the detritus of church and convent all stacked up for all to see, a sort-of architectural charnel house. The church itself is a bit of a disappointment, although there is one work there that is somewhat remarkable. It's a mosaic of of the BVM, but is modeled after a mosaic of Theodora (? 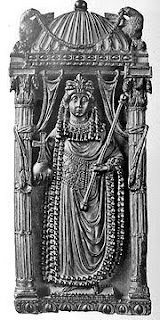 ), the wife of Justinian, in one of the churches below San Clemente in Rome. She, along with her sister full of swords over at La Santissima served to spur my own insight on the aspects of Mary that I shared in yesterday's post. (It's interesting how memories can become conflated). It's so close, so I go over to La Santissima. What is still remarkable about this church (Nave with 2 Transepts) is the choir which is a tribune, a circle - and a baroque circle at that. There is a mass starting, so I need to leave. I don't want to be like those pesky tourists who constantly circle the sacred mysteries at Notre Dame in Paris. Besides, nothing is engaging me here. So I walk out into the bright sunshine, and cross the Piazza della Santissima Annunciata to have a Coke Light, which is beginning to not taste as good as I remember it. The piazza is framed on one side by the church, and flanked by the backside (still a lovely portico) of the Gallaria dell' Accademia (which I will visit on Wednesday) and the Spedale degli Innocenti with its own wonderful portico. In the balconies of the academy, situated under the portico there, people have added potted plants, and above it is a varied roofline. The unity sought by the architects is blurred over time by the people using the buildings. This would have never survived the committee of a gated community in Blackwood, California! I walk to San Lorenzo, but it is crowded so I decide to not go in. I cannot resist, however, the Capelle Medicee. I shall never forget the over-powering emotion I felt when I first entered this room. It was, as the current exhibition is called, tutta maiestati. Sometimes in the 90s, however, a cornice came crashing down from the baroque dome, and since that time the space has been filled with scaffolding and temporary barriers. Most of the massive statuary is in restauro and thus the room has lost its power. One interesting note is that the altar, which dominates the east end, is temporary (who knew) and has been such since the eighteenth century. Originally commissioned to include elaborate inlaid stonework, the temporary altar was only made to simulate such work in order to convince a jury as to its merit. Now, the powers that be have located a voting station so that visitors can vote on whether to complete the project as originally intended, do something new, leave the "temporary piece", and so on. It was so mind-boggling that I couldn't vote. The Sacristy at San Lorenzo is always stunning. The power of Michelangelo's sculptures are so powerful and the classicism of the room is so refreshing that it is almost a necessary thing after the excesses of the Capelle. I descend to the ground floor, which houses the tombs of the Medici. This is not like Kapuzinerkirche in Vienna with all of its Habsburg tombs, each screaming for attention. For the Medici, those are upstairs, and they scream louder than almost anything. Down here, however, it is simplicity, with simple plaques placed on the floor. Most are honored, excepting those under exhibition articles (ostensibly honoring the person below) or those in the gift shop. Something tells me the Medici would understand - at least the gift shop. It's time to go find the American Episcopal Church in Florence. The last time that I was here, I went to the CofE church in Oltrarno, and it was sherry nice. This time, however, I've decided to see what my own church has done. It's beyond Santa Maria Novelle, whose piazza, by the way, has been nicely redone. Gone is the field of weeds and grass gone wild, replaced with modern seating, and lawns that are actually welcoming. The portico that faces it is still being restored. The church is so typical. A bit of England dropped down in this city of stucco and stone. I can't wait to go inside. 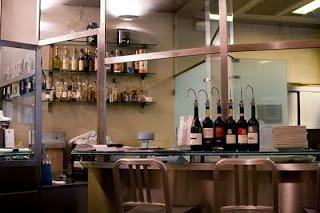 I drop by Il Sostanza but it is "no credit card" so I will do that another day. I have lunch on Piazza della Republica, dominated on one side by some nineteenth century public work. I suppose it's like going to Fisherman's Wharf to have lunch, but hey, it's relatively inexpensive, and I can look at people. I have a risotto al funghi, which is interestingly tomato-based. Hmmmm. I drink to half liters of water. Friday, 25 September 2009 "Erasures"
On my way back to the hotel I pop into the Palazzo Medici Riccardi. A bit of a disappointment here. The Museo Marmi was disappointing, however the Capella dei Magi is nothing short of spectacular. The depictions of the entourage of the Magi capture the faces of real people. After a nap I went out again to encounter Florence. I think I may want to climb the cupola again, or the tower, or both. At the Piazza della Signoria I realized that I hadn't eaten for a while, and had my heart set on a risotto de la mare. "Finito" said the water, so it pasta with salmon. I paused at the place where Savonarola was burned, as people walked over the tablet in the piazza (while I was trying to read it). No one seemed in the slightest bit interested. I also flashed, in a complete non sequitur to Helena Bonham Carter fainting on the piazza in "Room with a View". Time to take a walk. Down to the Arno I go across the Ponte Vecchio to Oltrarno, just to walk and to see if I restaurant that I liked was still there. No, it's now called "Nova" and judging from the menu, it's nothing like the interesting cooking that went on there before. So I continue on walking up the river, or is it down the river to the Ponte a Vespucci where I cross the Arno again and stop by the church of Ognissanti where the good monks are getting ready to say Vespers (I tried to go at the Duomo where the doorman assured me it was solo Domenici, yeah right. Then it's my task to see if Il Sostanza is still open. Barton Sheffield and I went there in 1989, and had a wonderful meal. I tried it again in 2005 and it was still good. I'll go back again - the place seemed to be open. I walk over to Santa Maria Novella, where I assured Arthur that they buried monks, and then planted a poplar on top of them. It must have been some other church, perhaps Santo Spiritu, or Santa Maria del Carmine; I know I saw it somewhere. No at Santa Maria Novella, monks are buried at the perimeter of the courtyard, almost a cloister, just inside the walk way, or in the walls that line the courtyard. And the trees...they're cedar, not poplar. Oh well. 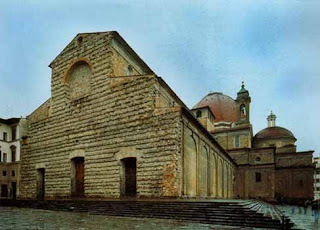 On my way home, past Santa Maria Maggiore, and San Lorenzo with it's Medici Chapel I notice the erasures in buildings. As I have often said, Italy is a place of interiors, but the exteriors are just as interesting. Arches, doorways, cornices, windows, niches, all are erased but not completely. It's as if the city is a palimpsest, with a whole new story written over sections of it. I waited for the church bells, but never heard them, and slept past my 8:30 Uffizi reservation. But, hey, this is Italy! What is time here? A quick shower will suffice, and maybe it's time to start growing a beard. Breakfast with all the other tourists in the breakfast room and out the door. Naturally I can't just go to the door with my on-line ticket, but have to go over to Door 3 to get a real ticket, which I do. Then it is up, up, to the top floor where there are wonders. 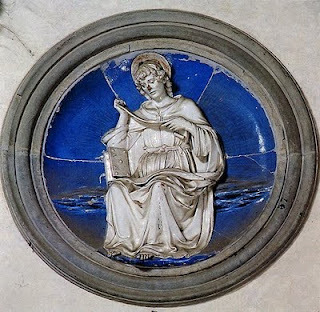 I commented on FB that if Bach is good for the soul, then Giotto is equally so. The same goes for Lippi, Vasari, and all the others. There is an Annunciation, a Visitation, a Visit of the Magi, a Crucifixion, and at the end I can only utter credo. The trouble with a museum such as this is the mind quickly numbs itself to all that surrounds you. Oh, there's a..., and there's a..., (do I have to look at all of these?). But you want to...look at all of these. Another thing, I think that they ought to devote just certain days to groups. Tuesdays, Thursdays, and Saturdays - Groups, all other days - just us. One nice thing, the leaders now have microphones which allow them to broadcast sotto voce into the groups' earpieces, thus keeping the sound level down. They do, however monopolize certain paintings. 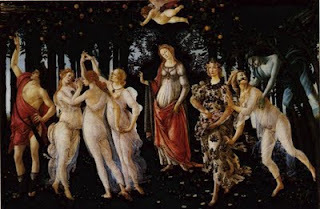 One group went to Venus on the half shell and then skipped all the other Botticelli. What a loss. And another thing, I was watching several Japanese tourists trying to decipher a painting of the Magi (in which the entire story is told - foreground the Adoration of the Baby Jesus, background - sighting the star, journey to Israel, visit with Herod, and then journey to Bethlehem. In addition, the whole painting was filled with arcane references and symbols. (I am reminded of David Sederis' horribly funny telling of a French class in Paris, when the students were asked to describe Easter). As I walked around later, I wondered what it was like to live in such a religiously saturated society. Buildings, heraldry, manners, language, song, all were deeply immersed within the Christian story. Several years ago I was at the Chiesa de la Annunciata in Florence, and realized all the different paintings of Mary: Mary disconsolate, Mary pensive, Mary in glory, Mary pierced, Mary crowned. Suddenly it dawned on me as I stood in front of one painting with Mary pierced with God-knows how many swords, that each of these were touchstones, points of identity for the common person who viewed them. They were a way of not only perceiving the story, but of taking it in, accessing it in a deeply personal way. That, I think, has been lost in our society, where protestant austerity has robbed many of such touchstones. As I walked on the Loggia that connects the two wings of the museum, I took some time to sit down and reflect. My Istanbulschmertz was gone. I was overjoyed to be here, and I realized that there was some freedom from not carrying around a camera. So thank you unknown thief who has my battery charger and other equipment. I am always amazed, really, at how easy it is to travel. All of a sudden you're here, and you're happy! I hadn't anticipated seeing a lot of Dürer and Cranach. This was especially heartening in that last summer, while in Munich, the collection at the Alte Pinakothek was closed. So there was Luther and Katie, and Luther and Phillip, and Adam and Eve, along with others. Nor did I anticipate all of the Baroque holdings. However, at this point the exit was beckoning and I was infected with what my sisters call MEGO (My Eyes Glaze Over) so I stepped out of the Renaissance and back into modern life. All the window shades are closed, and people stay asleep until around 11:30 or so. Slowly we all awaken and begin to adjust to the fact that we're already half-way through the day. The woman next to me asks if I would up the shade "ein bischen" and I do. She laughs, and remarks in German about a Magritte painting in which men are walking around on clouds. I look out - and it looks just like the painting, ohne menschen. There is a quick breakfast with sausage, ham, fresh breads, ementhaler, and fruit, and we're on the ground in Frankfurt. We don't unload at a gate but are bussed to another part of the airport. In Chicago they gave me boarding passes for Florence and assured me that I would not have to leave the security envelope. Wrong! Frankfurt is such a maze. Passport Control was hidden away, and getting to my gates was a real chore. Having arrived at the gate (on the first floor) we were all informed that ingress to the gate would not be for another hour and a half - so off to the Business Class Lounge to catch up on email. Nothing there looked inviting, food or drink-wise. Finally the gate is opened, and we bus out to an under-wing fusilage plane (I love this style of aircraft). The trip is wonderful, passing near Stutgart, and over the Alps. I look down, and there is Brienz, and the Brienzsee, and Thun - all wonderful memories from a summer with Arthur's family in Switzerland a few years ago. The Alps are playing games with huge cumulus clouds - it's really quite enthralling. The Tuscan countryside is really quite beautiful. I always think that Napa minics it so well, but from up above it in October it appears incredibly green and fertile. We land in Florence about 50 meters from the terminal, and a bus comes to pick us up! There goes my carbon footprint. To my delight, the cabs are relatively inexpensive, 20 Euro. The hotel (Casci) is as I remember it, small and friendly. They now have wireless, which makes me quite happy, and I am given my old room (8) back. It has a balcony that opens out to the gardens in back of the old palazzi that crowd Via Cavour. I unpack, only to realize that a bunch of camera accessaries have been stolen from my luggage. I quickly descend into an Istanbulschmerz (an attitude of despair - realizing that you've spent a great deal of money to travel somewhere, and it all may turn out bad). I am hoping that this really crazy attitude will disappear with the morning bells. Florence is hot and crowded, but I go out for a walk. I've had so much food on the trip that I don't eat dinner - just walk - attempting to get rid of the schmertz. At 21:00, I've had it and head to bed. I've never conked out so completely in my life. I think that half the fun of travel is the anticipation. So at dinner last night, I relished the time with Arthur, and the anticipation of the travel we would soon be doing separately and together. I got up early to see him off and to finish packing. I had allowed a great deal of time, so it was a leisurely pace that accompanied my shower and my last minute errands. The Yellow Cab came in minutes - they finally realize that people actually live here! It seems strange being at the airport again, having just traveled last Friday to Minneapolis. There's the usual breakfast at the Yankee Clipper (french toast, this time); then some shopping, and browsing, and the required trip to Compass Books, where I saw nothing that I needed. The flight to Chicago was inconsequential. I slept most of the way, or stared out the window. I was looking forward to the train trip to the International Terminal in Chicago, but Lufthansa boards flights in Concourse B, so there was no new territory to explore. I went to the Red Carpet Club and caught up on email and FB. It was a room of individuals, with very little relating going on. Finally it was time to board (22:00). They served us dinner! Which wasn't bad, a very nice salad with chicken breast, a skirt steak with fingerling potatoes, a cheese plate with brie, chevre, and a cheddar, and finally a bread pudding with chocolate sauce. There was a nice red to go with it all as well. The seat really did fold down into a nice flat plane and I actually slept...quite well. Usually, I keep a journal when I travel. Each evening ends with a Moleskin journal and a pen, and a few minutes of scribbling. This time, I'm trying something new. I've wanted to start a blog to augment Hillerleiturgia, but just haven't found the time. Now I can journal and share. I'll add links to Hillerleiturgia when I return home. Welcome!